The beautiful Egyptian theater in Park City, Utah. 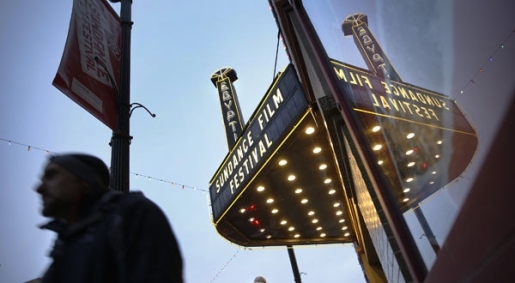 When it comes to the Sundance Film Festival, getting in is probably bigger than winning something while you’re there. If you get into the festival, then you can sell your movie, make back what you spent making it, and maybe even kick start a career. Director Jason Andreozzi knows just how important Sundance is, so when his documentary about Egypt during the Arab Spring was turned down for the festival, he made his way out to the Park City, Utah, film festival to get some attention by any means necessary. Hence the brilliant idea he had. Jason Andreozzi crashed Sundance while riding a camel through the streets of Park City. Of course, riding a camel through the streets is a great way to get noticed, especially if you want to get noticed by the police. In this case, Park City PD cited Andreozzi for obstructing traffic and told him to get off the street. They also warned him about handing out his fliers promoting his movie. Still, if he wanted attention, this is a great way to do it. As for the camel, he says he chose the animal because it is so easily identified with Egypt and the Middle East.